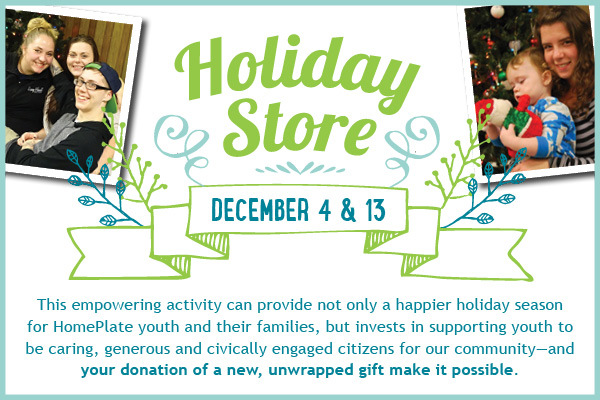 Our Holiday store provides young people the opportunity to practice generosity. This empowering activity can provide not only a happier holiday season for our youth and their families, but invests in supporting youth to be caring, generous and civically engaged citizens for our community—and your donation of a new, unwrapped gift make it possible. Gifts for all ages are appropriate as the youth will be giving them to their aunts, grandmothers, siblings, and babies. Donate items from the Gift Ideas list, sponsor a holiday gift drive at your work, community center, or faith-based organization, or gather gifts with your friends and family. Financial contributions are always welcome—65% of our funding is in-kind contributions, so the dollars go further, and the gifts always find an owner. Drop-off Location: Homeplate Youth Services, 12520 SW 3rd St. Beaverton, OR 97005. Call 971-322-9381 or email donations@homeplateyouth.org to arrange drop-off date and time. *Please keep items at or below $20 value to ensure equal distribution of gifts to as many youth as possible. For more information contact Brianna at activities@homeplateyouth.org or (971) 284-8988. Volunteers are also needed to help set up the store at each location, transport items between locations, provide personal shopping and wrapping services. Please contact Volunteer@homeplateyouth.org for more information about volunteering at the Holiday Store. We are very pleased to announce that Cirrah, one of the youth we serve, has been working as an intern at the City of Hillsboro since early September. The paid 6-month internship program, called “By You With You”, is for youth looking to expand their job skills through working 20 hours a week in an office environment and the City of Hillsboro. The feedback from her supervisor has been great so far and Cirrah says she loves the job! We’re excited and honored to participate in this awesome program! The Sit-n-Stay season at the Beaverton Farmer’s Market has ended with great results! Four youth worked over 556 hours from May until the end of September caring for over 260 dogs, which was our best season yet! Our partnership with our sponsor, Halt Pest Control, helped us to increase our visibility with new signage and expanded fencing. We’ve been able to expand our HomeBase leadership program with the support of a donor, and Al, this year’s Sit-n-Stay manager, did a great job leading the Sit-n-Stay crew this year. A big thank you to all of the volunteers who donated lunches to the youth while they were working this program. For the past five and a half years, HomePlate has been operating our Wednesday night drop-in at Merlo Station High School. We are really grateful for the people, activities, and relationships developed there. We've been notified by the Beaverton School District that we need to be out by June 20 for months of renovations. We are thankful for BSD, and especially Merlo Station High School, for their support over the last five and a half years. As a result of this decision by our site host, we're going to conclude our drop-in there by June 20. We are in the process of visioning and thinking about the best way forward and what comes next. We'll make a decision by the end of summer and let everyone know. We invite you to participate in that visioning process. Please contact Kirsten (kirsten@homeplateyouth.org) if you'd like to be involved. Stand Up with HomePlate raises over $46,000 for Youth At-Risk! Thanks so much for joining us for Stand Up with HomePlate! With your generous support we exceeded our goal and raised $46,500! The community came together at the PCC Rock Creek Event Center for a night of music, laughter and inspiring stories from youth. Guests and youth joined improv experts Brad Fortier and the Knock Outs on stage for each of the improv "games" and playful antics. Laura, a youth served by HomePlate received a standing ovation for her moving story of resilience and perseverance. Emcee Scott Palmer from Bag & Baggage Productions kept the evening lively and engaging. Music by Melao de Cuba gave a festive energy to the first annual event. A huge thank you for everyone who participated and helped to sponsor the event! We are particularly grateful to our Presenting Sponsor, West Hills Home Northwest/Mower Group Realty for their support and for joining us on stage for the improv games! Volunteers like Bonnie Martin are a ray of sunshine. When weary youth come off the streets on Tuesday afternoons to HomePlate's Beaverton Day Space, they are greeted by a warm smile from Bonnie. She welcomes them into the space and wholly accepts them for who they are. It is her mission to not only accept youth, but to create an environment where they have the opportunity to be who they are. Bonnie is the mother of two children aged 21 and 24. She has seen her own children struggle through the challenges of growing up and discovering their identities. Her eldest child is gender non-binary, so Bonnie has personal experience of working with youth who are figuring out who they are. She also has a lot of community youth work experience and has lead Girl Scout Troop #799, Destination Imagination, and co-lead Boy Scout Troop #728. When Bonnie heard about HomePlate through an ad for a donation drive that the Leedy Grange was running, she investigated HomePlate more and recognized it as a new opportunity to serve local youth. With her past experiences and generous heart, Bonnie has been able to contribute deeply to HomePlate. For almost a year, she has been a regular volunteer at HomePlate and actively uses compassionate listening to let youth know that they are heard, loved, and matter. This can be an empowering interaction for youth who often feel marginalized and overlooked. She assists youth in finding what they are looking for, whether it’s shampoo, socks, or a coat. When HomePlate has been low on much needed items, like bottles of water, she has stepped up to help meet that need through personal donations. We are very grateful for the consistant and caring support Bonnie offers to our youth at HomePlate!